My step father, Gary Aitken, was one of the greatest men I have ever known. He passed away seven years ago, but left behind wonderful memories and lots of love. This poem was written in honor of him. I hope it can be passed along to all the wonderful Dads out there! Happy Father's Day! 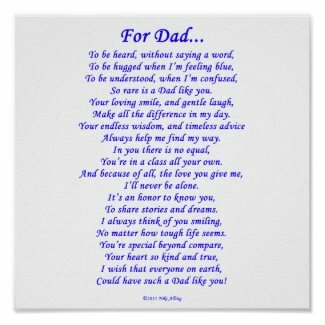 An inspirational poem for your Dad, comes on many gifts. The picture will take you to gift shop. 4th of July, Dating and Sparks!